One of the biggest issues programs on community stations like Radio Centre-Ville face is getting the word out about their existence. With new technology it has become much easier than ever before to establish an audio web presence. That is certainly true for many of CINQ’s programs. Podcasts and iTunes have made it possible to gain listeners in ways that were once unimaginable. Having said that, I thought I would spend a few paragraphs here introducing you to three programs that you might not necessarily be familiar with. I believe they are each well worth listening to. I will admit that I have been involved with each in some capacity over the past few years, so I may be a little biased. Let’s begin with one of the most underrated programs on Montreal radio. Arts Notebook airs every Saturday from 11:30 AM to 12:30 PM on CINQ 102.3 FM. The program is hosted by Stanley Asher, who has been a fixture on Montreal radio for over 30 years. Asher is also involved with Radio Shalom, a radio station in Montreal that serves the Jewish community. Asher used to teach at John Abbott College but is now retired. He is probably one of the smartest people I have ever met. His co-host is Davyn Ryall, who is the Artistic Director of Village Scene Productions and very well-known in Montreal theatre circles. There are probably few people who are as knowledgeable and passionate about Montreal theatre than Ryall. Arts Notebook mostly features guests from the city’s cultural scene. When it comes to film, theatre and/or music, if it’s happening in Montreal, you will hear about it on Arts Notebook. Every show features interviews with performers and production people from Montreal and elsewhere. You will almost certainly hear about stuff not ordinarily mentioned on commercial radio stations. I move on to another unique listening experience: Scottish Voice. It airs every Saturday between 1:00 PM and 2:00 PM on CINQ 102.3 FM. For over a decade Cape Breton-native Janet Stubbert has brought listeners authentic music from Scotland and Nova Scotia as well as special guests and interesting stories. It is the only Scottish-themed program of its kind in Quebec. Where else on your radio dial will you come across authentic Gaelic lessons? I have been involved with Scottish Voice as technical producer for about two and a half years. In that time I have learned more about Nova Scotia culture than I ever imagined possible. Since the end of 2010, the reach of the program has expended to include listeners on K-LEE 1600 AM in Baddeck, Nova Scotia. You can listen in on K-LEE Sundays and Wednesdays at 6 PM ET. And if you miss a program, you can log onto the Scottish Voice Podcast Archive or subscribe via iTunes or Podbean. And finally, another program that deserves a lot more attention is The Digital Life Show. It airs every Saturday from 2:30 PM to 3:00 PM on CINQ 102.3 FM. Host Reisa Levine describes the show as “a half hour weekly Podcast and radio show featuring regular guests from all sectors of society who are working and playing in the digital domain…” The program differs from a lot of other so called digital shows in that it doesn’t focus on gadgets. The Digital Life Show is more interested in digital media’s impact on society. From Managing Editor of Le Devoir, Roland-Yves Carignan to Montreal star blogger Steve Faguy, the quality of the program’s guests is very impressive. Current digital news is also a subject of discussion as are the place of grass-roots movements involved in the digital world. Check it out, it’s another program that deserves to be heard. You can also subscribe to The digital Life Show on iTunes. 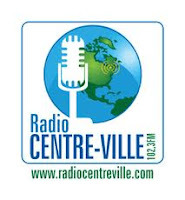 So there are just a few examples of Radio Centre-Ville’s English language offerings. English programming runs from every Friday night at 10:30 PM to Saturday afternoons at 4:00 PM. Shows are available through live streaming at the Radio Centre-Ville web site. Here is the complete schedule of programs along with podcast links. Hope you find something enjoyable!